Answers in Genesis (AiG) is hosting its five-day Easter Conference at the Ark Encounter next week, April 17-21. 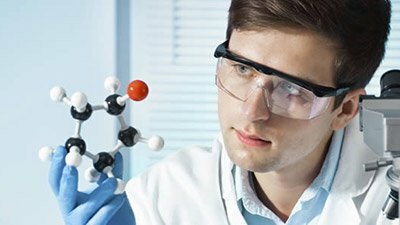 Sponsored by PureFlix.com, this apologetics conference, with practical pointers on how to defend the Christian faith in a secular culture, will feature speakers Ken Ham of AiG, evangelist Ray Comfort, astrophysicist Dr. Jason Lisle, famed impersonator Ben Price, and many others. The AiG Easter conference will provide a clear, logical defense of the Christian faith that will answer the many skeptical questions people have today regarding the Bible and Christianity. The conference will also equip Christians to engage skeptics in an increasingly secularized culture and challenge non-Christians concerning the truth of the Bible. All are welcome to register for the conference or attend the free Easter sunrise service. The stunning new state-of-the-art 2500-seat auditorium inside the Answers Center, with a bright 70-foot-long LED screen. 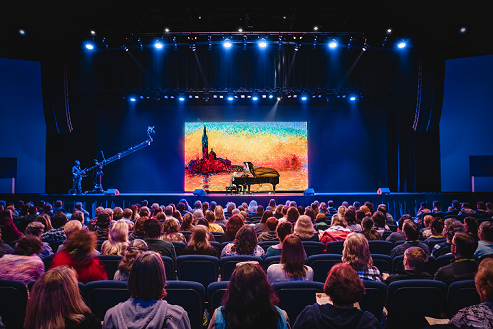 As Christians celebrate Easter on April 21, AiG will host attendees from 38 states, and five nations in the brand-new Answers Center at the Ark attraction in Williamstown, Kentucky, for a time of teaching with an apologetics emphasis. 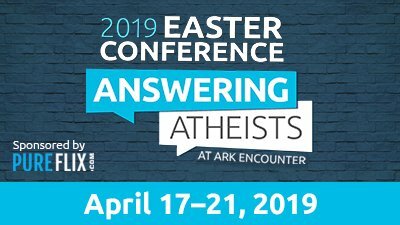 The conference is called “Answering Atheists.” The American Atheists decided to hold their annual conference in Cincinnati because the Ark Encounter and Creation Museum are in the area. That is one of the reasons AiG decided to conduct its own conference, also recognizing that the current generation is more atheistic. Furthermore, Christians need to know how to better reach atheists with the gospel. American Atheists often hold their annual national convention on Easter weekend. Members of the atheist community will gather from all over the world next week as they attempt to counter the Christian message. The atheists’ 2019 National Convention will be held in downtown Cincinnati, April 19-21, north of the Ark Encounter. AiG has offered American Atheist conference attendees free admission (upon showing their AA conference badge) on Saturday evening at 7 p.m. to meet Ray Comfort and watch the world premiere of his new movie The Fool. So far, that invitation has been rebuffed by one AA official. At AiG’s Easter Conference, families and individuals may choose from several multi-day pass options, which include all conference sessions, daily presentations, and other activities. Meal options and retail discounts are available as well. The conference is sponsored by the on-line streaming service PureFlix.com, which has over 400 AiG videos available for viewing. 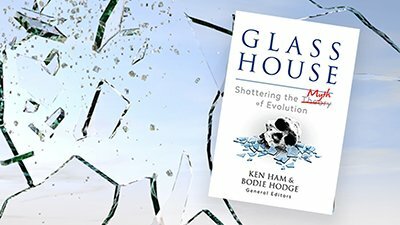 Keynote speakers include AiG’s CEO Ken Ham and evangelist Ray Comfort, along with a diverse lineup of dynamic presenters from AiG and other organizations. Comfort is a renowned author of more than 70 books and a co-host of the award-winning TV show The Way of the Master. He is the founder of the evangelistic ministry Living Waters. The conference includes a presentation by Ben Price who is recognized as Australia’s best impersonator. With spot-on impersonations of Arnold Schwarzenegger, Donald Trump, and 200 other personalities, Price was a grand finalist on Australia’s Got Talent television program in 2011. After Easter Sunday’s free service, attendees can enjoy a special brunch at Emzara’s Buffet restaurant beginning at 8:30 a.m. Located within easy walking distance of the sunrise service, Emzara’s will feature entrees such as carved lamb, ham, fried chicken, pot roast, and more. AiG, celebrating 25 years of outreach, is an apologetics (i.e., Bible-defending) ministry based in northern Kentucky, near Cincinnati. AiG’s Creation Museum, located west of the Cincinnati Airport, has welcomed four million visitors since opening in 2007. AiG’s Ark Encounter is a one-of-a-kind historically themed attraction with a massive Noah’s Ark as the centerpiece, which draws more than one million guests a year. More information about AiG can be found at AnswersInGenesis.org. Conference info is on the event page.